RoyalEnfields.com: Royal Enfield motorcycles in India: can you pick out the differences? can you pick out the differences? "Hi. I am an avid follower your blog. My friend just bought a brand new C5 Royal Enfield and I thought I will point out an important difference between the 'Indian' Royal Enfield and the exported one: sari guard!" He's referring to the screen on one side of the motorcycle, intended to protect the flowing clothes of Indian women, who ride side saddle, from the spokes. Note the little "foot stool" at the bottom of the sari guard for both feet. These used to be available as an accessory from Royal Enfield USA, but I don't see them in their on-line catalog at the moment. I have heard that some jurisdictions in India actually require the sari guard as standard safety equipment. Perhaps that explains why it is fitted to this motorcycle, even though it has no passenger seat. Even without the sari guard, this would be a very nice looking motorcycle. The gray color is not available in the U.S so far. 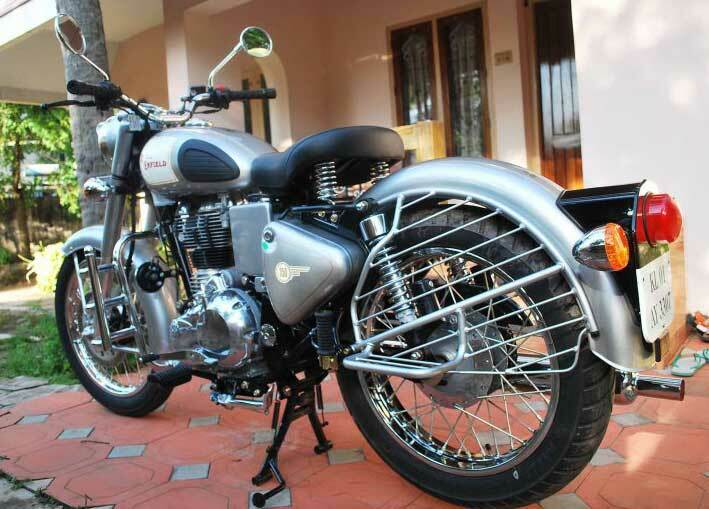 It is available in India on the Bullet Classic 350. I asked Ranjith if his friend's C5 had something else we miss here: a kick start lever. The U.S. C5 is electric start, only. "It indeed does have a kicker," he replied, attaching another excellent photo as proof, and adding "I personally would never buy a Bullet without a kicker and frankly I am quite disappointed that the export models do not have one." Perhaps the U.S. will eventually get the gray color and a kicker; or, at least, the sari guard! 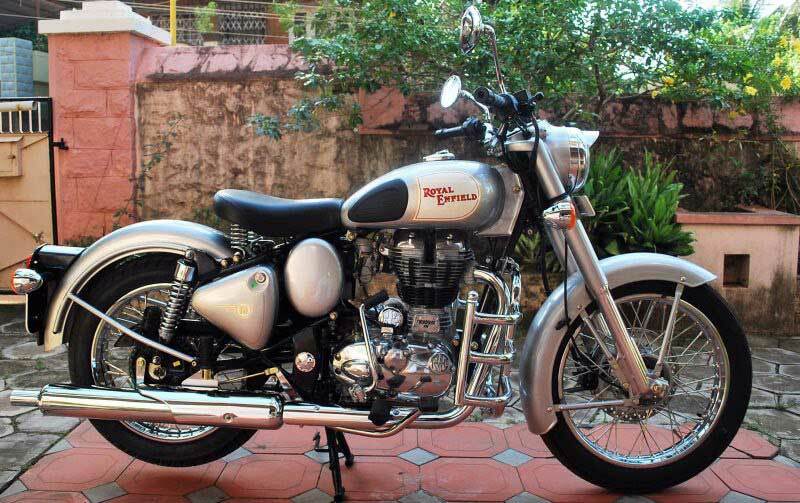 I recently purchased Royal Enfield Thunderbird (Twin Spark) in India. Saree guard is not default accessory to best of my knowledge. There was option to buy either rear leg-guard or saree guard. I'm interested for the side bag-rack (to see picture_1) where can I by this part?